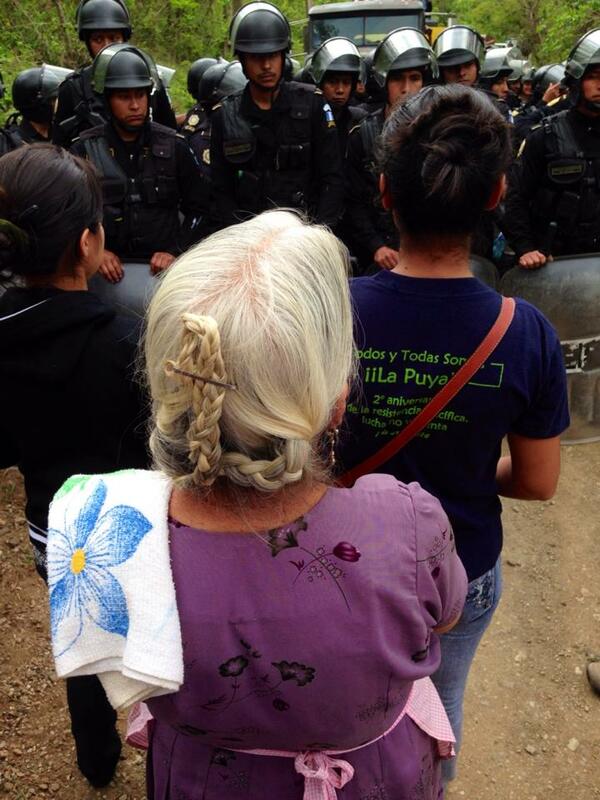 Early in the morning of 23 May 2014, scores of riot police and heavy machinery arrived at La Puya, a peaceful anti-mining protest camp in San José del Golfo, Guatemala. 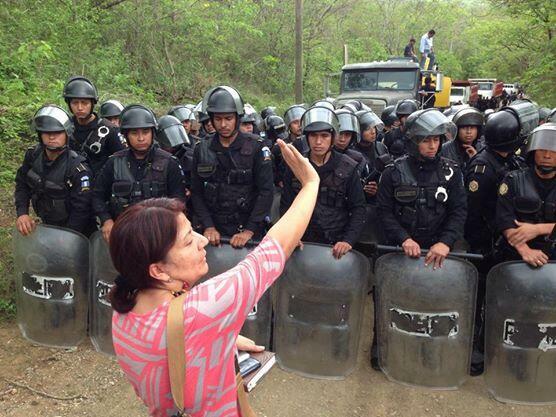 The convoy tried to enter the Tambor mining site, which has been blockaded by protesters over the past two years. Yolanda Oquelí has helped to lead the protest movement and she described recent events at La Puya when she spoke at the London event ‘Guatemala: No Going Back.’ Yolanda strongly condemns the ongoing presence of US-based Kappes, Cassiday and Associates (KCA), current owners of the Tambor gold mine, and Vancouver-based Radius Gold, the mine’s previous owners who have retained significant investment in the project. Yolanda explained that women were at the front of the protest during the May eviction. Police used tear gas on the crowd and several women were badly beaten. One woman had several ribs broken in the scuffle, while another compañera is still in hospital with head injuries. Yolanda has suffered for her vocal stance against the mine. She has been the subject of ongoing harassment and she is regularly followed by unknown persons. In June 2013 Yolanda was shot by unknown assailants, and to this day she still has a bullet lodged in her body. The metal fragments have not been removed as they sit too close to her spine. She says that the injury causes her constant pain. Following the 2013 shooting, the Inter-American Commission on Human Rights requested that the Guatemalan government provide Yolanda with protective measures, but she says that the Guatemalan authorities are now putting pressure on her to leave the country altogether. “But it is my country,” Yolanda states adamantly. “It is the others who have to leave.” She feels it would be cowardly to leave her family and friends behind. Yolanda’s involvement in the anti-mining movement has also been hard on her family. A mother with young chidren, Yolanda tearfully related how one of her young ones saw a photo of her on Facebook at a protest, in which she is standing beside a woman with a bleeding head. Her children are fearful that their mother will be injured, or worse. Yolanda says that she cannot chose between her family and the activism she has risked so much for, as she is fighting on behalf of her children. She does not want to see them end up with health problems associated with toxins from the mine.